Once upon a time I could care less about reading books about the navy in the age of sail. Now I can't seem to get enough of it. My latest read is A Battle Won by S. Thomas Russell. Due to all the detail, as I was reading I was sure that the book was written by someone from England. I was surprised to discover that Mr. Russell was, in fact, born in my home city of Toronto and now lives on Vancouver Island a few minutes from the seashore, with a love of sailing. 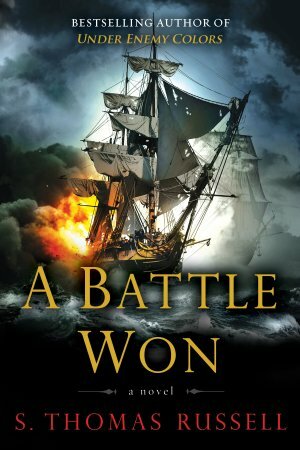 "Master and Commander Charles Hayden returns in the sequel to the international bestseller "Under Enemy Colors. Winter 1793-the Reign of Terror rips through revolutionary France. In Plymouth, England, Master and Commander Charles Hayden is given orders to return to the ill-fated HMS "Themis" as the British fight the French for control of the strategically located island of Corsica. But within hours out of port, Hayden's uncanny knack for attracting the attention of the French navy sees "Themis" thrown back into action. When she lands in Corsica and her men join forces with native insurgents, Hayden finds himself at the vanguard of a brutal clash of empires"
For the most part, it is a fast paced book. Mr. Russell is very knowledgeable about the period and quite detailed in his writing. Once or twice the book bogs down due to all the detail. I could have done without the chapter about the game of golf and, although I was forced to skim a little, overall it is well-paced and I quite enjoyed the adventure. As the book description says, this is a sequel to Under Enemy Colors, the first book in the series about Master and Commander Charles Hayden and the ship he commands, the "Themis". I am looking forward to reading that one and hopefully there will be more to come as Mr. Russell has gained another fan of this series. I must say, based on the synopsis you provided, a chapter on golf does seem out of place. However, I've only just started getting interested in the whole Reign of Terror so I'd probably still give it a shot.